McMahon Architects has designed new office space for online home goods company Wayfair at their corporate headquarters in Boston, Massachusetts. Originally founded in 2002 and rebranded in 2011, Wayfair is a pioneer of the online furniture and décor realm and now offers 8 million products from over 10,000 suppliers across six distinct brands – Wayfair.com, AllModern, Birch Lane, DwellStudio, Joss & Main, and Perigold. As the growing company expanded the footprint of their Back Bay headquarters, Wayfair engaged McMahon Architects to create space that promoted the company’s dynamic culture and highlighted the incredible city views. McMahon Architects worked hand in hand with the facilities team and the general contractor to deliver a space that encapsulated the company’s mission to innovate every day to create the ultimate home goods shopping experience. Following the client’s directive to create a unique space that highlights the central Boston location and unifies the various office floors, McMahon designed a central connecting stair featuring a multi-story image encouraging movement and showcasing a singularly-quirky moment in Boston’s history – the flight of the Museum of Science’s life-sized Brontosaurus statue over the Charles River. 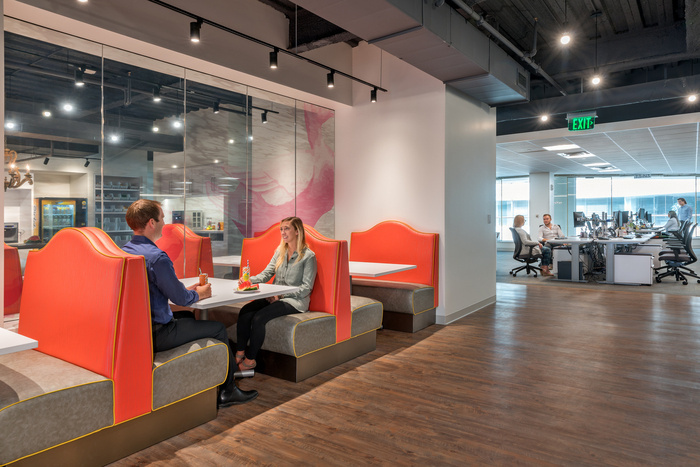 To further promote connection between departments and to highlight the vibrant corporate culture, the open work environment was punctuated by vivid over-scaled graphics and dynamic Wayfair product that anchored collaborative meeting areas. The heart of the new space is the cafeteria. A variety of seating, activities and food/beverage offerings provide an opportunity for the employees to engage and unwind with one another while transparent film highlighting Boston landmarks in a pop-graphic way furthered the design intent while still allowed natural light to filter through the space. 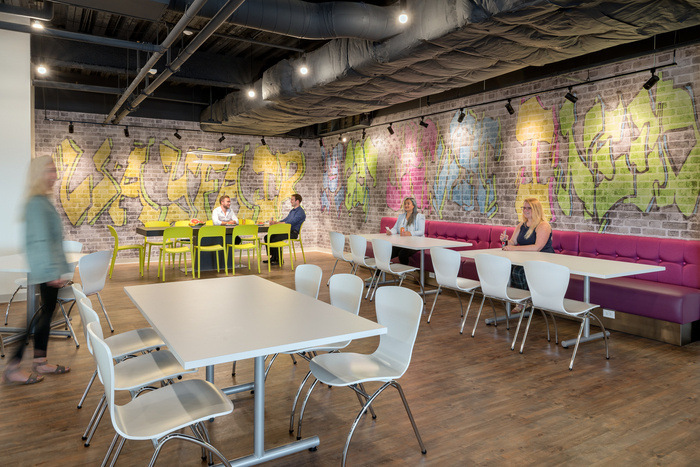 Since occupying the space, Wayfair has enjoyed the new connection between their various floors and the amenities that their expansion has offered.